The project of developing an optimal furnace for advanced experimenting on orbit started in 1984 at Miskolc University, the Institute of Materials Sciences under the auspices of the Intercosmos program of the former socialist countries. Only the fortunate collapse of the Soviet Union could halt the launching of our first version onto orbit. It has been re-designed according to the NASA requirements in 1999. 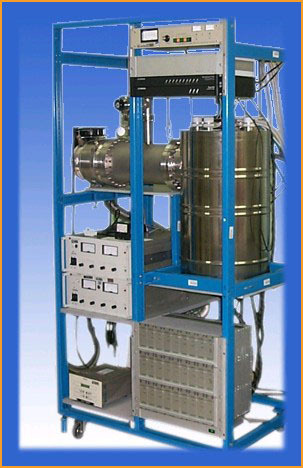 In general, UMC is a universal microgravity research equipment developed especially for utilizing microgravity for solidification experiments. Furnaces are absolutely motionless, both the sample and the heating facility are completely fixed. The elimination of all internally generated mechanical disturbances ensures the best microgravity level possible within its environment. It can accommodate a wide range of user selected crystal growth techniques or temperature profiles meanwhile keeping the uncontrolled temperature fluctuation at very low level (below 0.2oC). Software package helps the researcher to design, control and evaluate the experiment. UMChas successfully served many flight definition and ground-based projects by providing a flexible tool to check and develop experimental phenomena for the NASA Materials Science Program. NASA bought two of our medium temperature facilities in 2002 and has recently ordered a high-temperature upgrade for one of them. Motionless - Both the sample and the heating facility are completely fixed throughout the processing. 24 dynamically interrelated heating zones process the required temperature profile over the sample.